The thesis "more children are born to welfare claimants" does not appear to be supported by the data, and certainly not by the data cited by Perkins. In contrast to Perkins’ Figures 9.1 and 9.2 showing average number of children for working, mixed, workless and troubled households, Portes has also tweeted and ONS figure showing the data for socio-economic classes, but this is not average number of children, but 1-2 children and 3+ though the former is said to be the better measure of average family size. This is only one aspect of the thesis Perkins is putting forward, but it is an important one. From a methodological point it seems to revolve round the distinction between “all workless households” and “all workless households with children” where the first is the better measure of the interaction between worklessness and welfare than the second. To my eye the different measures (average number of children) versus (percentage with 1-2 or 3+) make the final comparison somewhat more difficult to evaluate. I am always doubtful of "household" arguments, never being sure of what a household is. Suppose two unmarried dole bludgers have four children, but choose to maximise their benefits by pretending to live apart. Then they will appear to have an average of 2 children per household. Won't they? Will they? The corresponding working couple will presumably admit to living together, having no incentive to lie, and will therefore show up as a four child household. 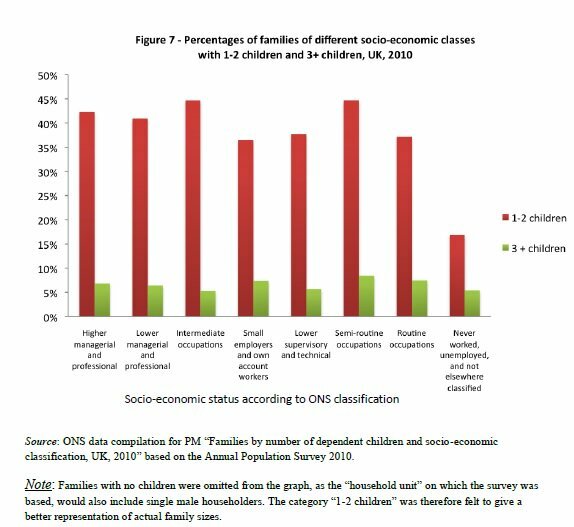 In a sample containing one of each couple, 67% of households are workless but contain only 50% of children. Is there any correction for age applied? I mean, could a household headed by an unemployed person be a family where the husband, in his late fifties, has lost his job and is finding it difficult to replace? Such people will normally show up as having no children in the household. If Mr Portes has a good argument he appears to have disguised it well. Maybe it's in the links, eh? Workless people might also suffer mental/psychological problems which prevent them to have normal family. Strong point. I suppose the lesson is that you'd need remarkably detailed data to let you check for such effects.